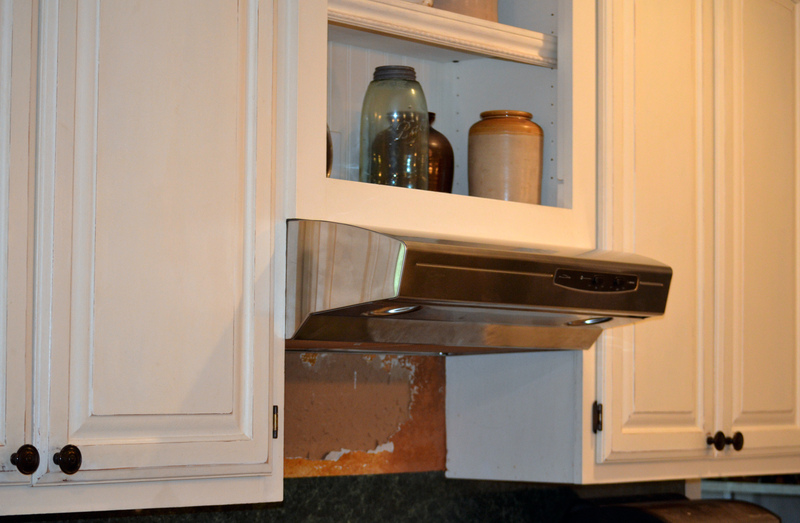 I ordered this stainless steel vent hood for the stove from Overstock. It’s a mid-range hood to replace the solid black one we once had and the SS is to go with the new appliances I plan on putting into the kitchen. The price was good – about $200 with the additional charcoal filters being bought with my Reward points. To get a super nice fan would have been well over $600 and I simply wasn’t going to spend that for this house. 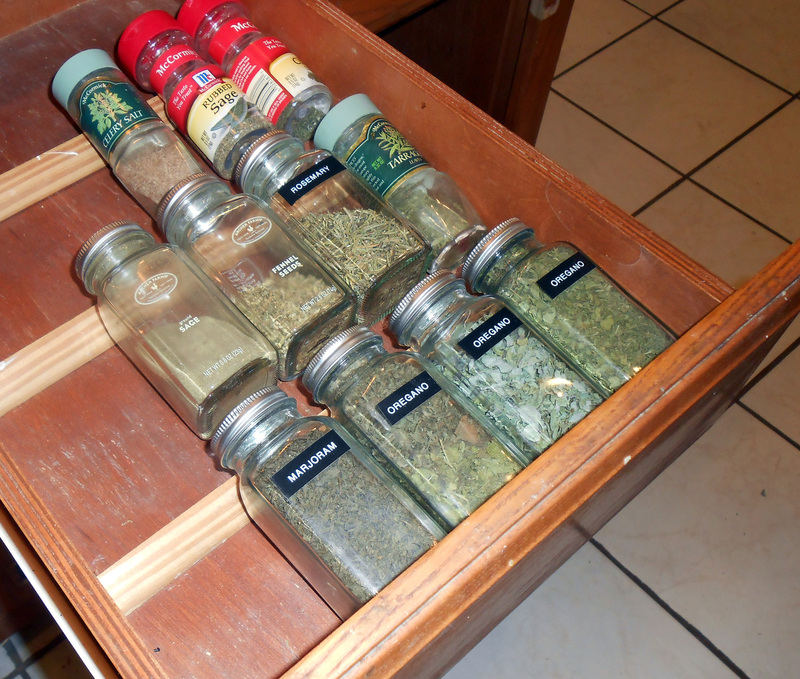 I didn’t buy from Lowes or Home Depot because I just didn’t like the selection; what I found at those stores looked small and cheap. I relied heavily on reviews because I bought online. I couldn’t get to hear the fan or see it in person: the noise on low is definitely less than the old fan; when on high the noise is quite obvious but that is pretty true of any fan. I have to write that I’m overall very pleased. 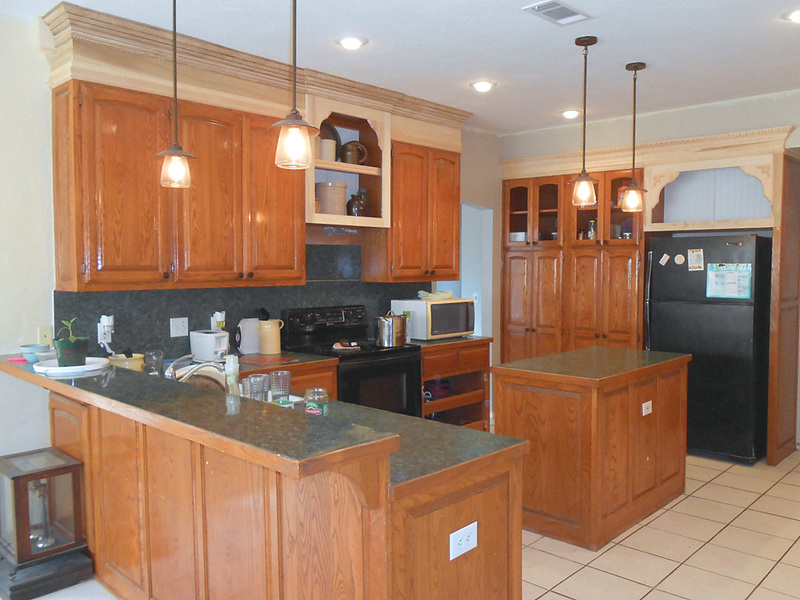 I like the substantial size of this hood – it makes the whole area appear bigger than what it really is (30″ wide). It has a modern sleek look that doesn’t look as cheap as others in its same price range. I also like that it has two lights and they are located at the front of the unit so they can be easily replaced. Of course it will look more impressive once the backsplash is done and the rest of the kitchen appliances are in Stainless Steel but at this point it’s baby-steps. 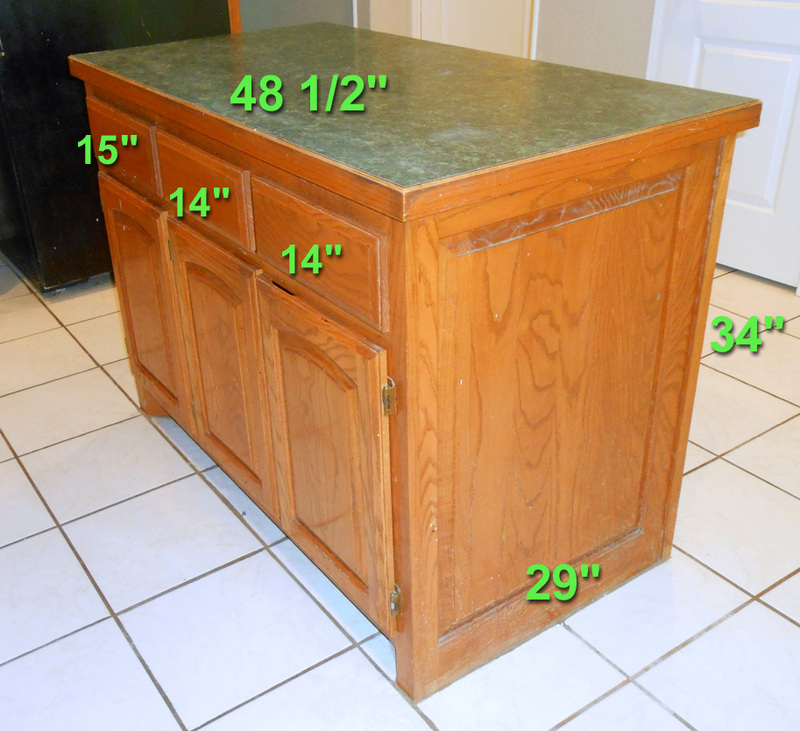 Next up for appliance replacement is the dishwasher, then fridge, and lastly stove as the stove is a great appliance and is being replaced only for looks. But before all those expenses, back to the family room ceiling…. 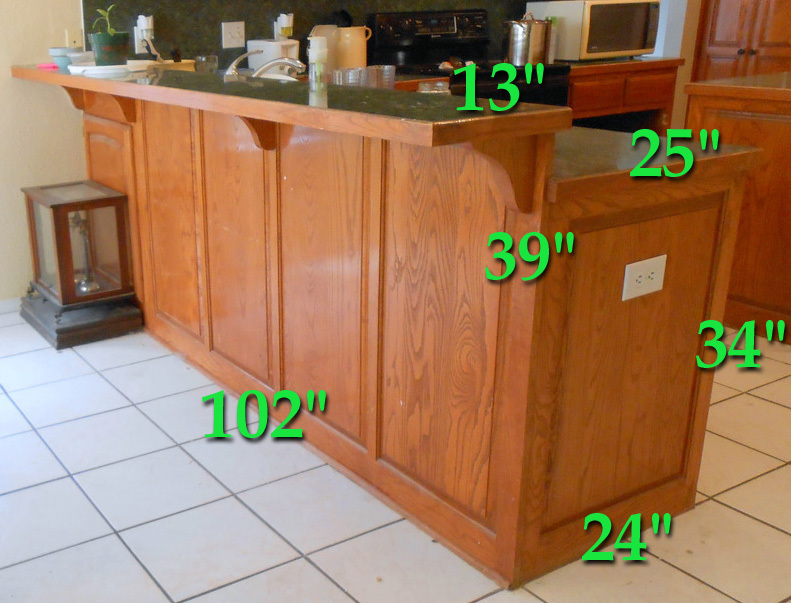 I’ve always hated the breakfast bar in our house. It was never used and always in the way. 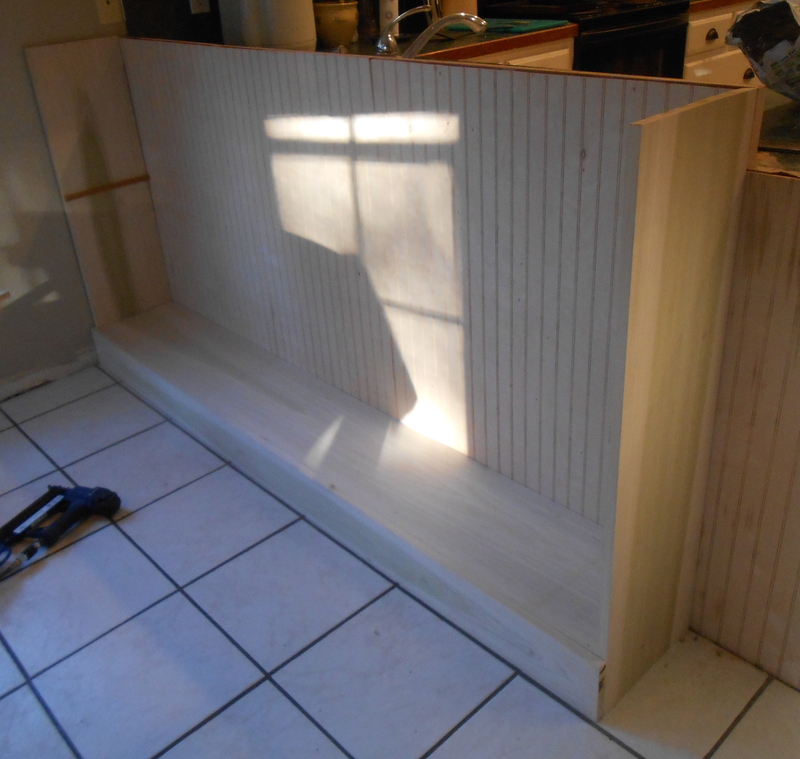 In the re-design this going to become a bookshelf and display unit. We played around with several ideas and some of the inspiration photos you can view in my Pinterest board for Kitchen (2013), specifically, this shelf design in the kitchen by Ross Chapin. 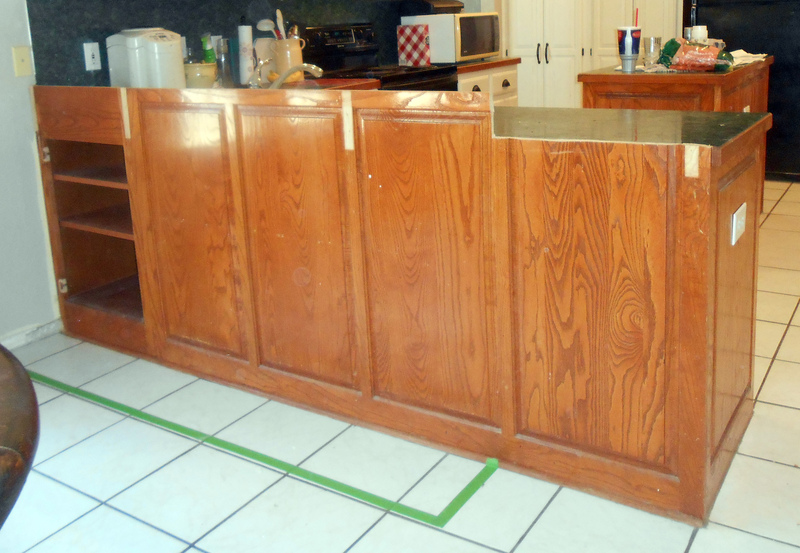 First, the breakfast bar countertop is removed and one side trimmed down to the new countertop level. 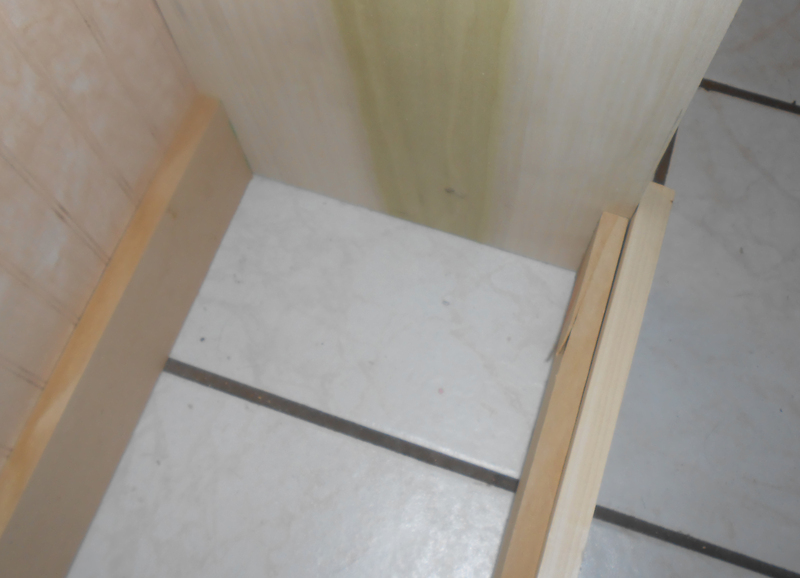 We marked out with green painters’ tape on the ceramic floor the footprint size of the shelf unit. 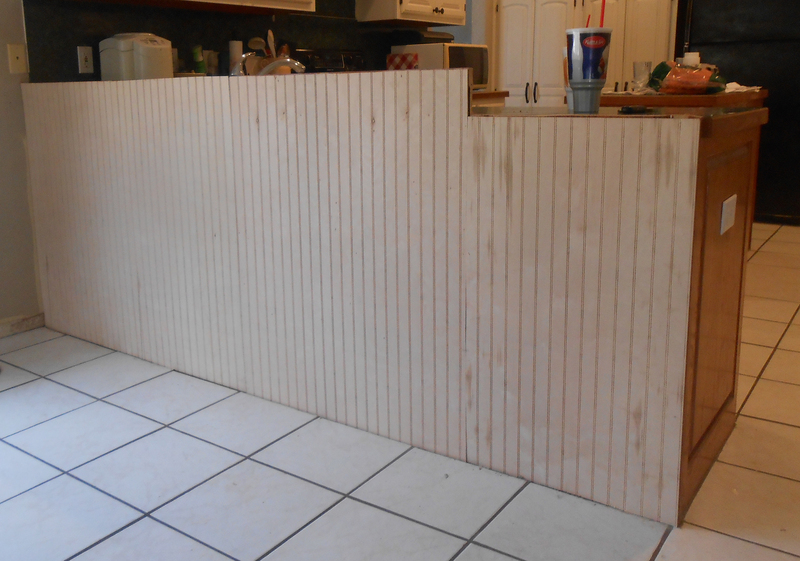 Because it would have been impossible for us (with our skills) to redo the back to match the original (see end of breakfast bar) we covered it with beadboard. 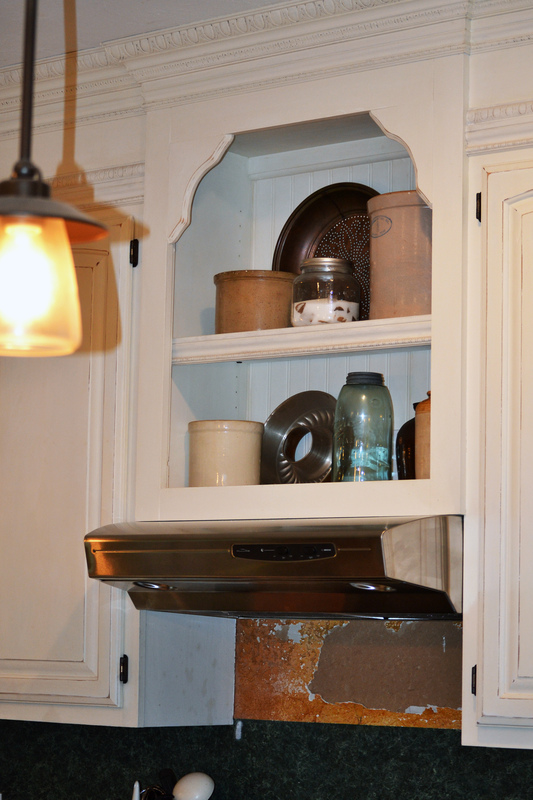 Eventually, the end of this cabinet unit (where the white outlet is on the right) will also be covered with beardboard and all painted the cream chalk paint color. 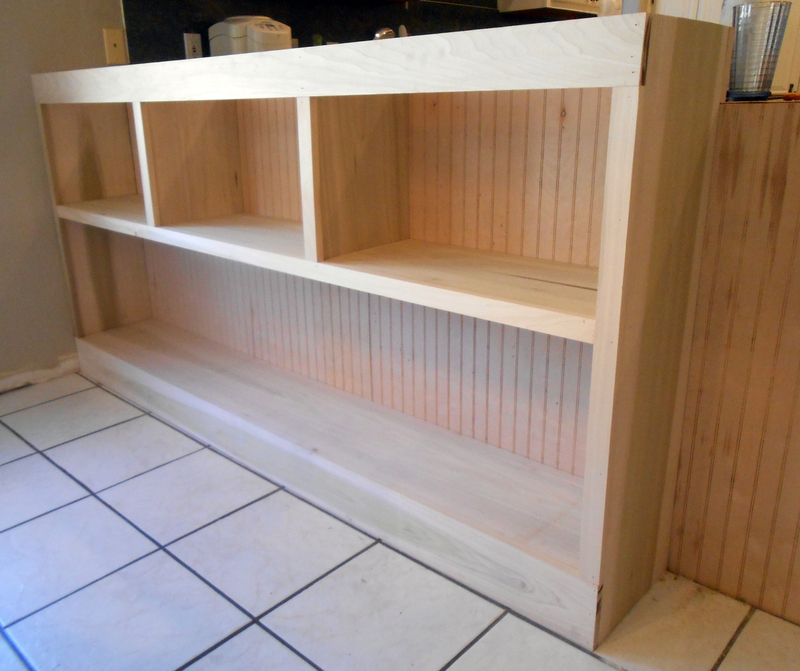 The next step is to start building the frame of the actual shelf unit. These boards are Poplar, a nice compromise as oak would have been very expensive in the size of boards we were working with (and would have been painted in the long run) and pine would have been too soft. There are two upright boards, and three long horizontal boards (one not visible in the photo below) on the floor. 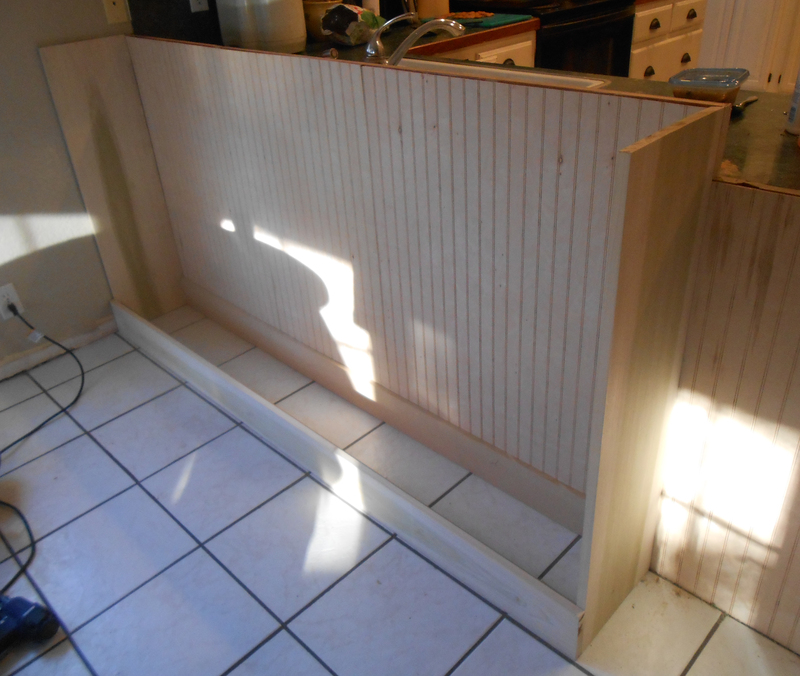 The left end board has been nailed to the wall. To make these types of units go easily, I highly recommend buying or renting a nail gun. Using a nail and hammer just doesn’t make it go together easily and with less effort as a nail gun and compressor. 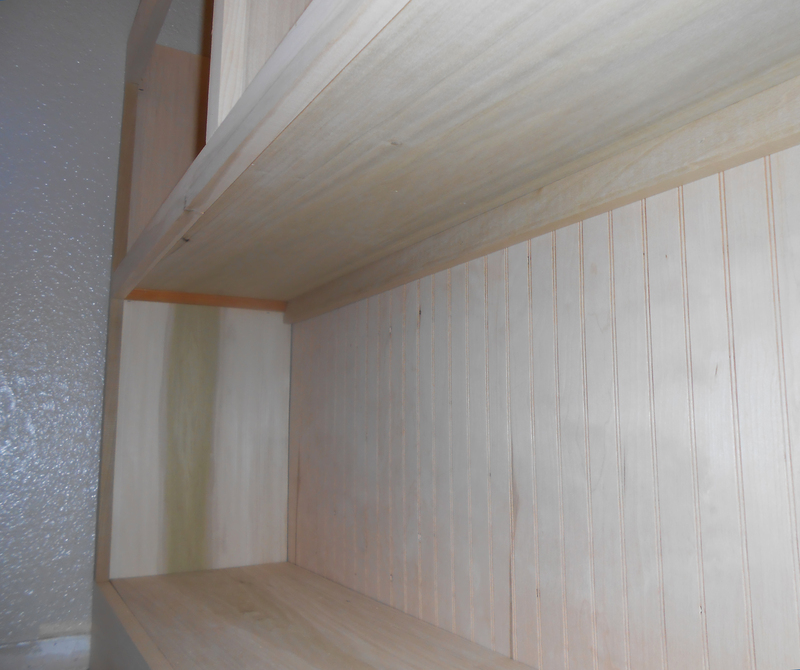 Here you can see the inside placement of boards to allow for the bottom shelf to rest upon, and for the edge to be hidden by the front horizontal board. 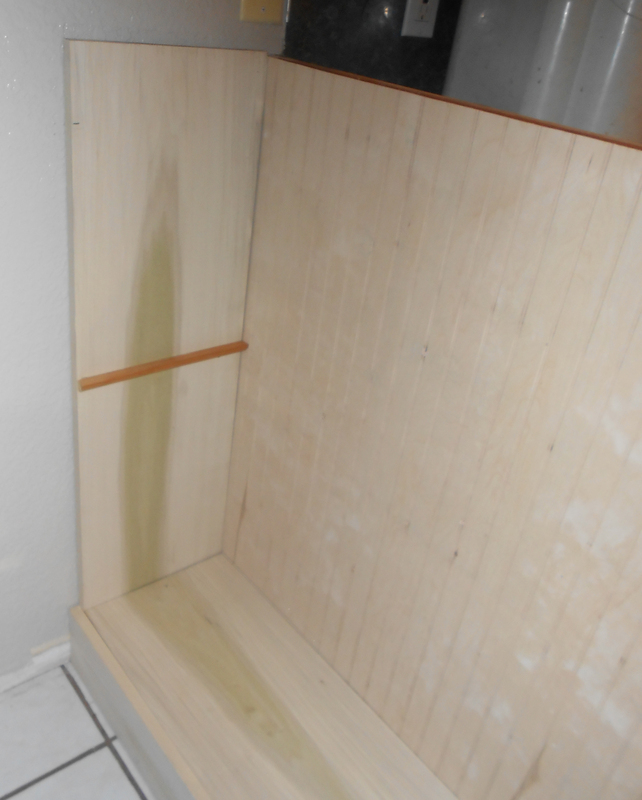 The bottom shelf rests on the boards and is nailed in place. 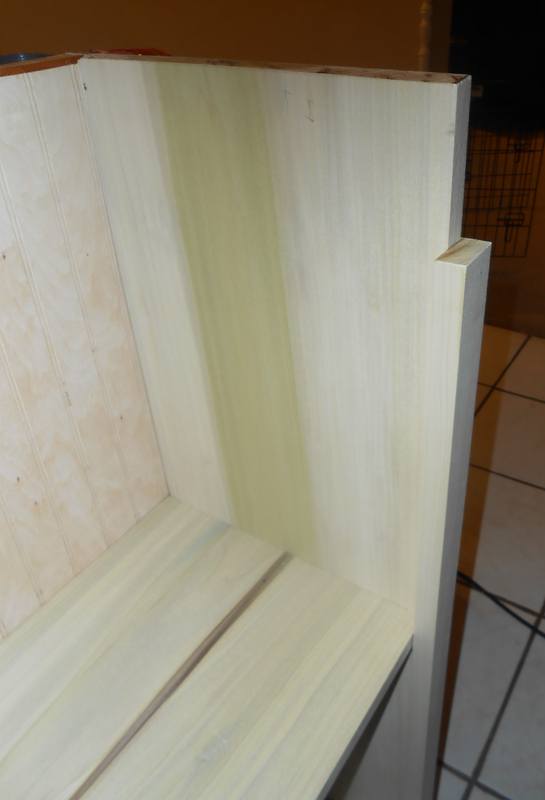 On the inside of the uprights, a small piece of wood is placed for the next shelf to rest upon. At this point, you can only see it if you look under the shelf. 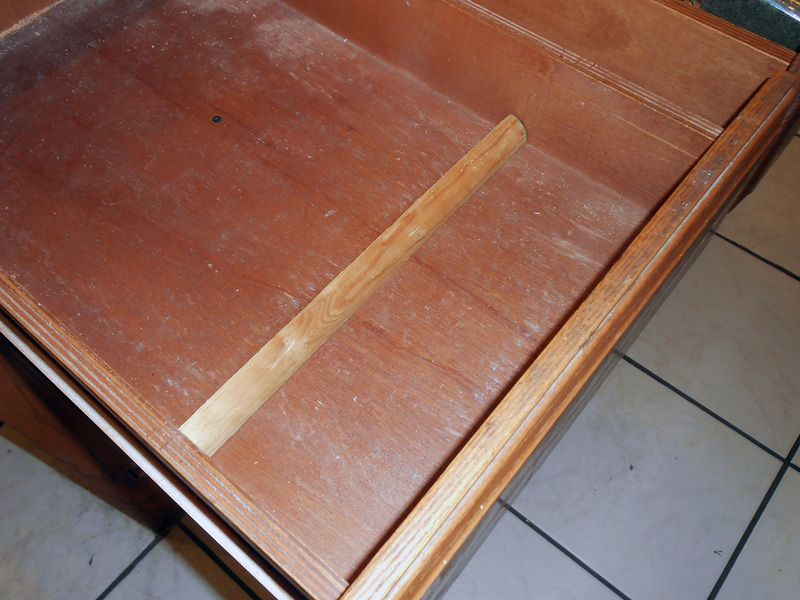 A long, horizontal bracing piece was also placed against the back of the unit to support the shelf. 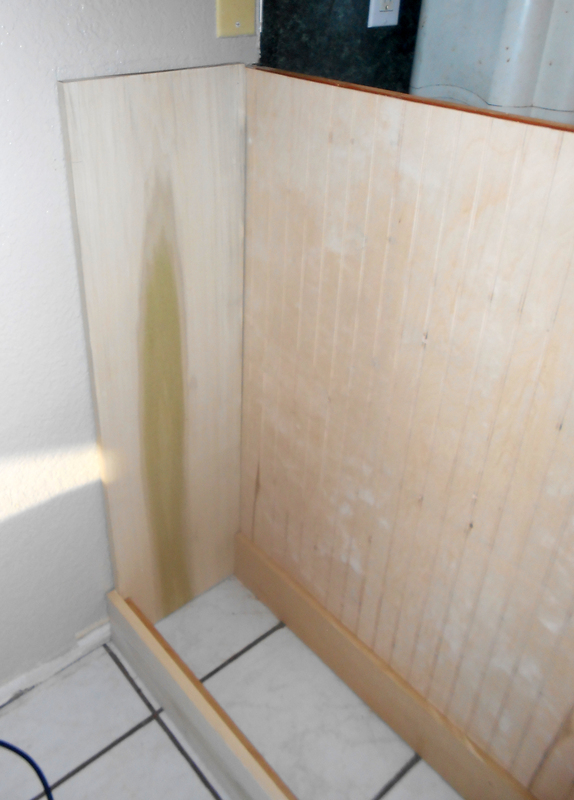 A front piece of horizontal board allows for a smooth profile. The vertical board are not the same height – their shorter size allows a horizontal facing board across the top of the unit. 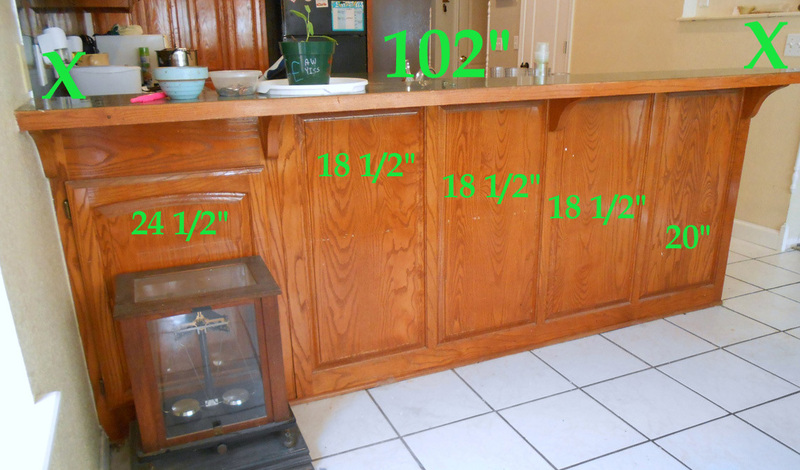 The inside uprights, that divided the top shelf into three units is set behind the facing boards. 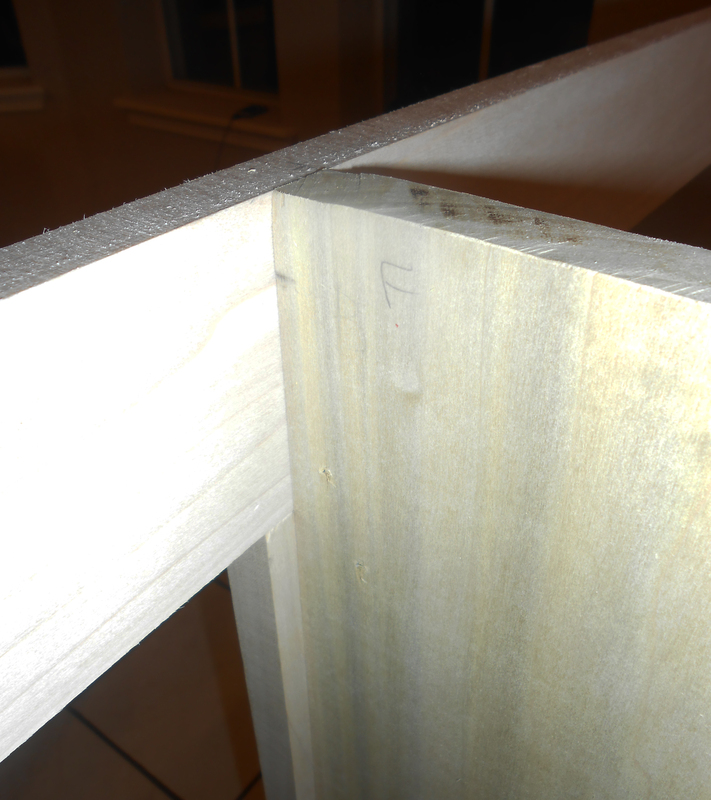 It is nailed in at several points, including the front, the bottom and toenailed in at the back with hand hammering.